Occlusion of the proximal or midbasilar artery will result in infarction of the pons. Usually this leads to bilateral damage. The infarcts are often shaped irregularly, depending on individual variation in collateral blood supply. Severe bilateral injury usually leads to coma and death. An even worse situation is extensive bilateral damage to the ventral pons with destruction of descending motor pathways, but preservation of the dorsal pons, allowing for relatively normal function of the reticular activating system and consciousness. This is called “locked in” syndrome, in which the patient is awake but cannot move anything at all, except perhaps look up (this function lies in the dorsal midbrain). Reading over this slide on Sunday sent me into a trailer- and clip-watching frenzy. 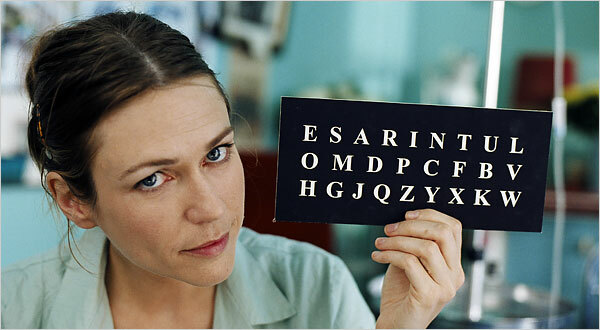 The Diving Bell and the Butterfly is a film I was supposed to see years ago, but I’ve kept dragging my feet. The book upon which the film is based was written by Jean-Dominique Bauby, the editor-and-chief of Elle magazine, who suffered from a stroke when he was 43 that left him completely paralyzed with the exception of his left eye and lid. Unlike 90% of those with locked-in who pass away within the first four months, Bauby lived a little over a year, long enough to dictate an entire book by blinking his left eye as letters were read to him in order of frequency of use. He died two days after its French publication. The book took about 200,000 blinks to write; an average word, about two minutes. His book is heart-breaking and hopeful and beautiful…and you can imagine how this movie is one I’m dreading seeing, but one I can’t bear to miss. This makes me think of the folks Oliver Sachs worked years ago, described in his book, _Awakenings_, which was turned into a movie in which the Sachs pseudo-character is played (straight) by Robin Williams. Hi Jim! Thanks for the note…yes, we are also studying neuro diseases like the one depicted in Awakenings, still need to see the movie, though. There is so much we don’t know about the brain, it’s terrifying. I hope Christine’s mom died peacefully.